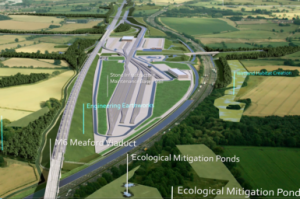 A second additional provision to the High Speed Rail (West Midlands – Crewe, HS2 Phase 2a) Bill was introduced to UK House, which proposes a number of changes arisen as a result of requests from petitioners, directions from the select committee currently considering the bill, and further design development, principally in relation to utility works. The introduction of the Bill to the House was announced by the Parliamentary under Secretary of State at the Department for Transport, Nusrat Ghani. The Bill highlights six changes including the lowering of the viaduct at Kings Bromley, a revised and more simple Handsacre junction layout, where Phase One connects to the West Coast Main Line, a new traction power connection, requiring over 7 km of high voltage electricity lines, temporary and permanent power supply routes to the Whitmore and Madeley tunnels, a southward extension of the southern end of the tunnel at Whitmore and works at and around Crewe station including the extension of platform 5 to accommodate 400m HS2 trains. All of these changes require additional land to be acquired, and/or works to be carried out. An environmental statement setting out the significant effects and mitigation from the changes in the additional provision, alongside a supplementary environmental statement reporting new environmental information relating to the scheme was published. The public consultation on the documents will run until 29 March 2019. From 2027 the Phase 2a line, running between Fradley in the West Midlands and Crewe in Cheshire, will connect with existing high-speed services to carry passengers between London and Crewe. Services will travel onwards to places like Manchester, Glasgow, Liverpool, Preston and Wigan.